Salman Khan and Katrina's FAKE COZY PIC goes VIRAL; Fans go CRAZY! Salman Khan and Katrina Kaif's on-screen as well as off-screen chemistry is loved by the fans. The duo was in a relationship earlier and had done many films together which were the box-office hits. Now an edited photo of the two together has come up on social media that is also no less adorable. A photoshopped picture of much younger Salman and Katrina appeared on social media that shows them posing together in a cosy manner. While the actor stares at the camera, a smiling Katrina gives him a sweet hug. And fans have gone crazy on social media. 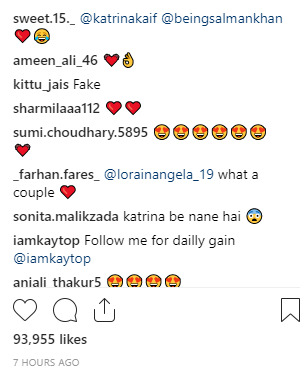 They are reacting with heart emojis and few users were commenting "couple goals". It is believed that Salman Khan helped Katrina to achieve big in Bollywood but their equation had turned bad when she got into a relationship with Ranbir Kapoor. However, the duo reunited in 2017 for the film Tiger Zinda Hai and once again they are all set to come together for the film Bharat which is being directed by Ali Abbas Zafar. Sonam Kapoor to walk the RAMP for cancer survivors! Uday Chopra's Cryptic Tweet talks about SUICIDE; Is he in Depression?